Writer: James Mangold (story by), Scott Frank, James Mangold, Michael Green (screenplay), and more for characters by. Starring: Hugh Jackman, Patrick Stewart, Dafne Keen, Boyd Holbrook, Stephen Merchant, and more. 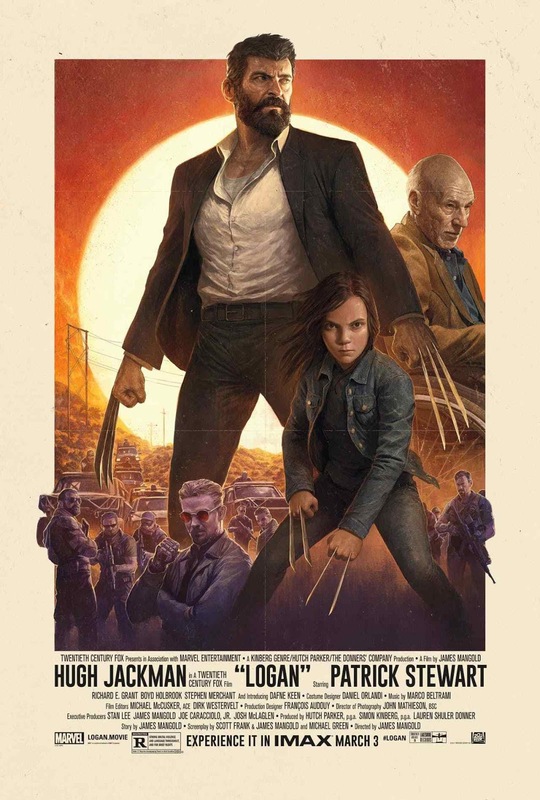 As the aged and bedraggled Logan (Hugh Jackman) tries to go about his life under-the-radar while also caring for an even older Professor X (Patrick Stewart), this incognito lifestyle is short-lived when a new mutant graces the duo with her company and also brings along the evil force that is after her, violently desperate for her capture. So, as a major Wolverine fan, my response to this film is as follows: This was the Wolverine I have always wanted. The brutality, the rage, the attitude, his true name, everything. I was brought such joy (and tears) for a straight two hours. Thank you, Hugh Jackman, James Mangold, and everyone involved in this film… Now, to give a fair and honest opinion from my perspective for the sake of reviews, ‘Logan’ is one of the most honest and well-developed superhero films to date. It did not rely on entertaining fast and constant action, it did not rely on quirky comedy, it did not rely on over-the-top dark themes. It was as close to a realistic story-line that a film about superheroes can get to. There are scenes within the film that radiate human emotion that showcase how much these “mutants” sometimes wished for a normal life but clearly were not able to achieve said normality. Powerful stuff and wonderful to watch unfold on screen… Beyond that, the pacing of this film was wonderful to me. It blended a dramatic story-line with intense and brutal action to perfection, IMO. This may be one of the most debated points of this film as between my friends and some criticisms I have seen only have stated that it felt “slow” at some points but to be honest, I see pacing a major matter-of-perspective point. Some people just have more patience and are invested in different stories than others will be so regardless, if you invest yourself in the dramatic story that is ‘Logan’, you will not feel this “slowness” some have experienced. ‘Logan’ is the rightful send off for the characters we have grown to love in the form of Professor Charles Xavier and Logan “The Wolverine” as well as the actors portraying them in Patrick Stewart and Hugh Jackman. Fueled by powerful performances, a superb story filled with emotion, and ultimately a foul mouthed and brutal Wolverine we have truly wanted for 17 years. ‘Logan’ lives up to its pre-released hype. The fan in me is beyond happy with this film but also sad to see the end. The cinephile in me is satisfied with such an excellent film portraying true consequences with being a superhero. Posted in 2017 Movies, Movie Review.Tagged Dafne Keen, Hugh Jackman, James Mangold, Logan, Patrick Stewart, Wolverine, X-Men.